With a growing number of owners turning to batter power to reduce emissions and bunker consumption, Wärtsilä has announced one of its latest hybrid propulsion projects is looking to cut fuel use in half. 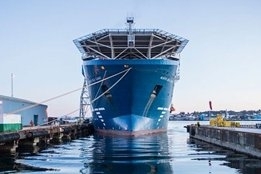 The installation onboard the North Sea Shipping AS owned North Sea Giant, one of the world’s largest subsea construction vessels, combines a diesel-electric configuration with batteries. The project involved an initial installation carried out last year, and a more recent second phase to share load and energy between three installed battery systems. “This is a forward looking solution that offers both cost and environmental benefits, including less maintenance, reduced fuel consumption, and fewer exhaust emissions,” said Sindre Utne, General Manager, Wärtsilä Project Centre, Norway. With regulations on vessel emissions tightening, battery power is expected to play a growing role in marine power. Norway last year unveiled plans for the world’s first zero emissions control area (ZECA).